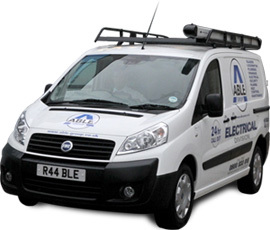 Able Electric provides electrical maintenance services that are second to none. Covering electrical repair, safety, testing, wiring and installations 24/7, you can rely on us to have your property maintained all year round so your business can run smoothly and efficiently. Our professional electricians are also available for domestic properties with free quotes and estimates for all electrical work. All our Electricians are security vetted and quality assured so you are guaranteed your property will be dealt with safely, efficiently and with minimal fuss.